It's feeling like a loooong week and it's only a Monday! We have a lot going on this week with library, MAP testing, and Book Fair all crammed into one week. Plus, I'm also trying to do some teaching at some point this week as well. I created a quiz that I decided the students needed over our novel and we're also creating our mosaics which involve shredding construction paper - we're having lots of fun in 5th grade!!! So, to relax and ease my mind about my upcoming week I thought I'd link up tonight with a great mentor for Social Studies! Thanks to Amanda and Stacia at Collaboration Cuties for hosing such a great linky! This text is called, How to Make a Cherry Pie and See the United States. This book is great for teaching geography, United States natural resources, as well as economic concepts like interdependence and specialization. In the book, the main character and her dog really want a pie for the Fourth of July. However, the pie shop is closed. So they set off across the country to put together everything they will need to make a cherry pie. I wish the book focused more on the "pie ingredients" but it does get a little side tracked with things like clay for the baking dish and cotton for a pot holder... however, the book does an excellent job at showing specialization and interdependence while taking readers on a cross country tour of the United States. It also has a companion book, How to Make an Apple Pie and See the World. It's a great book if you teach regions of the United States and need to hit economics as well as the geography! Plus, it's a great review of all the states with whimsical drawings. Definetely worth checking out! This a book I just added to my collection this year knowing my new curriculum in Ohio was going to be Western Hemisphere Geography with history and economics interwoven into the geography of our country. I haven't used it yet this year but if I create a handout or SMARTfile I'll be sure to post something on the blog! 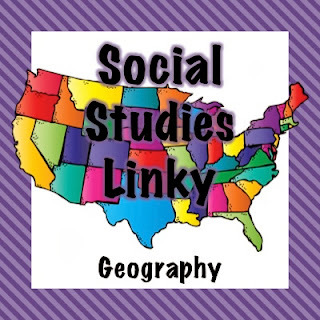 This also connects nicely to Diane from Fifth in the Middle's Social Studies Linky Party! So don't forget to stop over and check out all the great postings and link up your ideas! I'm linking up this post to her Geography category! I love reading in Social Studies! I was just thinking that I hoped that you linked it up. Yay! !